It's that time of year again. No frost, but on Tuesday night the temperature dipped down to 42.8° Fahrenheit. That's chilly enough that tropical plants such as bananas and such get the signal that it's time to stop growing. Besides, with large plants such as these it's easier if I bring them in because I choose to do so rather than because a freeze really is going to drop down and blacken cannas, bananas and such. 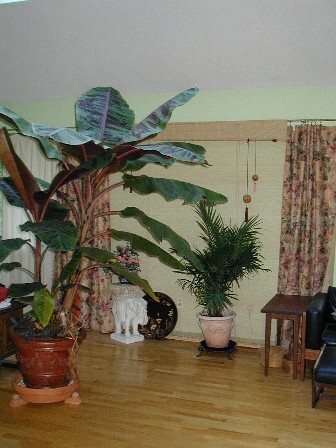 The major players that need two people to haul them indoors are the smaller (well, in relative terms) banana, the larger banana, the fan palm, and the weeping fig. I can handle most everything else by myself. 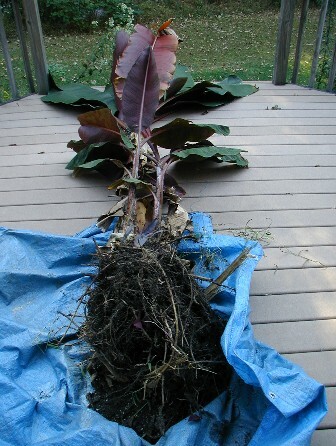 The larger banana is dug, its roots semi-swaddled in a tarp, and hauled across the lawn and up onto the back deck. It's a mess, loose dirt on the floor but the banana is jammed into its pot. Needs more soil around the root ball - without my steadying hand it would crash to the floor. The smaller banana was in a pot all summer, so it was just a matter of carrying upstairs. 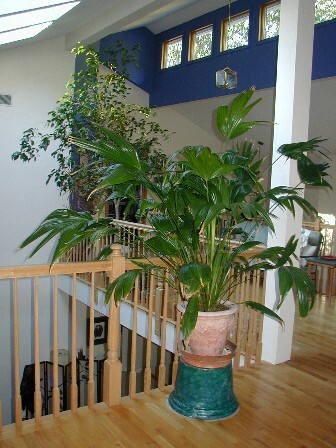 The fan palm looked out of proportion with its pot on the floor. Much better elevated on a larger terra cotta pot that I'd sponge painted a while back. the chandelier over the stairwell landing had a few precarious moments. It's been months since these plants were indoors. Maybe I've simply forgotten how much space they occupy. Perhaps they've grown during their summer vacation outdoors. Whatever the reason, it certainly looks green in here. And a little more awkward to walk around in some places. Top down on her Mustang convertible, our hair blowing in the breeze, Ellen and I head off to West Grove, Pennsylvania on the first day of autumn for the very first ever Eastern Performance Trials, Fashion in Bloom - The 2006 Collection. 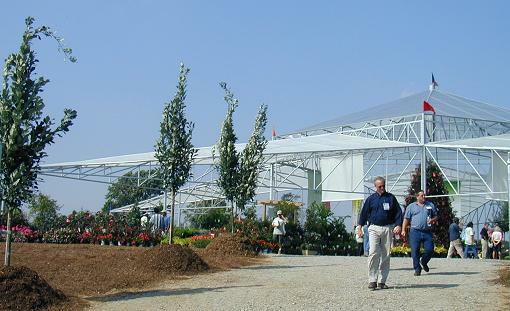 Growers, buyers, and garden center owners are offered a preview of plant and garden trends. Six days, six locations in Virginia, Maryland, and Pennsylvania, this special event is designed to do for independent retail garden centers what fashion week in New York City does for the clothing industry - showcase what's up and coming for the next season. Each of the six sites showcases 2 to 5 growers, different at each venue. Hosted by Conard-Pyle Company, especially reknown for their Star Roses, West Grove also featured Fischer USA, showcasing geraniums, osteospermum, diascia, calibrachoa, verbena, and some absolutely stunning lantana; ItSaul Plants from Atlanta, Georgia, where Bobby Saul's keen eye and interest in plant breeding has given us such excellent plants as deliciously lemon yellow Echinacea 'Sunrise' and warm orange 'Sunset'. I remember when I was in Atlanta for a speaking engagement in mid-November of 2005, and one of his greenhouses filled with flowering plants of these two cultivars. 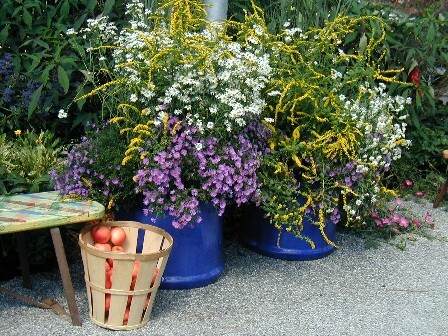 North Creek Nurseries in Landenberg, Pennsylvania focuses on started plug production of perennials, grasses, and ferns, with emphasis on eastern North American native perennials, both species and their cultivars, and new perennial introductions. They have a good range of Landscape Plugs™, super-size plugs useful for landscape restoration, highway plantings, conservation projects, and more. North Creek has teamed up with Prides Corner Farms for their American beauties program, intended to focus attention of our great native plants. Some of their selections include low growing Coreopsis pubescens 'Sunshine Superman', with non-stop cheery yellow daisies from mid-summer to October. Lastly (and far from least) is the Novalis Network of Growers and their Plants that Work® branded line of 500 perennials for sun and shade in 6-pack quarts, 19cm, and 3 gallon sizes. Hydrangeas, Evison/Poulsen® Festoon clematis, roses, orienpet lilies, Big Sky echinacea, Twice as Nice™ re-blooming daylilies and more offer a tidy display system for good-looking plants in their signature pale green pots. We arrive, park, put up the top (I considered asking Ellen to leave it down as an inducement for rain) and walked across the grass to the floating marquee and the alluring displays of plants. With the first five days restricted to invitation only, there was none of the crowding and tumult that you find at a trade show. While the fantastic plants could almost speak for themselves, company representatives were available, willing and able to answer questions. There is a real garden feel to the event, with plants arranged for effect, looking better together than they would individually. It's all about design. 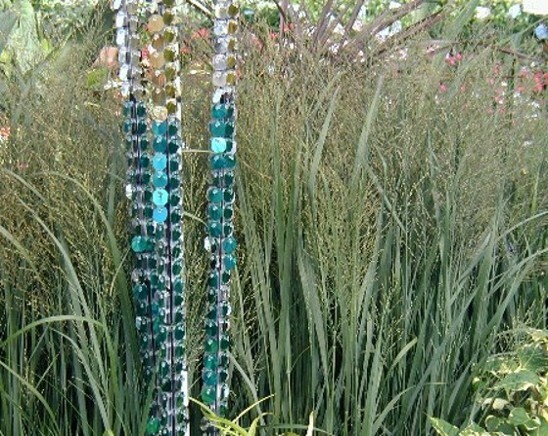 Fashion's flair, inimitable style, added panache, and exciting garden vignettes provided by Simple's Simple Garden Art and also Michael Bowell's Create-A-Scene. 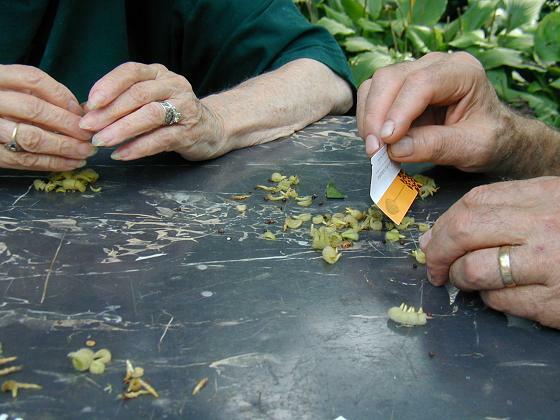 Gardeners are no dummies, and we know that it is all about plants. A "garden" of hardscaping might be a contrived landscape, but hardly welcoming and not what I'd call inviting. Old favorites, cultivars of familiar plants, new plants on the cutting edge - gardening is the never-ending story, with more to learn, something else to grow, and a welcome journey down the garden path. Here's to next spring, when our gardens will be perfect (perhaps only in dreams, but that's what gardening is all about.) Two images - do they whet your appetite? If, not, there's sure to be something that will, at the independent garden centers next spring, encouraged by the Eastern Performance Trials. Of course you are familiar with green beans. And dry beans too. But did you know there's an intermediate, in-between stage of bean that makes a succulent dish? Called shell bean, they are a delicious end-of-summer treat. The green beans got away from Carol. She'd been picking, and picking, and picking. And the bean plants kept producing and producing and producing. She couldn't pick fast enough to keep the green beans from developing into shell beans. So I bicycled over to her house on yet another sunny September afternoon. We went into the garden, each with a large pot, and picked them full of overage pods of green beans. Then we went and sat on her shady patio, companionably shelling beans and quietly talking the hour away. In the end I bicycled home with 5 cups of beans, leaving Carol with a dinner invitation for the next day. Shell beans don't keep very well. I put mine in a paper bag, and refrigerated them. While shell beans take longer to cook than green beans, they take less time than dry beans. Besides, you don't have to soak them overnight. Here's the recipe from "Chez Panisse Vegetables" that I followed when I was ready to cook them. You need about 3 cups of shell beans for 4 to 6 servings. 1) Put the beans in a heavy pot and barely cover with water. 2) Add a Tablespoon of butter or olive oil, and some herbs for flavoring. I used a fresh bay leaf from the potted shrub outside the front door, and a few sprigs of fresh thyme and some savory. 3) Place the uncovered pot over a medium high flame and bring just to a boil. 4) Turn the heat down to keep things at a gentle simmer, and cook for about 30 minutes. 5) About 10 minutes before the beans are done, coarsely chop half of a large onion. 6) Sautee in some olive oil over a medium low flame, stirring occasionally. You don't want the onion to color. 7) Peel and sliver two large cloves of garlic, and add to the pot. Cook until both onion and garlic are translucent, stirring occasionally. 8) Coarsely dice two plum tomatoes. (I removed the seeds and gelatinous goo that's around them first.) Add tomatoes to pot, raise heat to medium and cook until soft, stirring all the time. 9) Drain beans, saving liquid. Note: At this point I measured the beans. 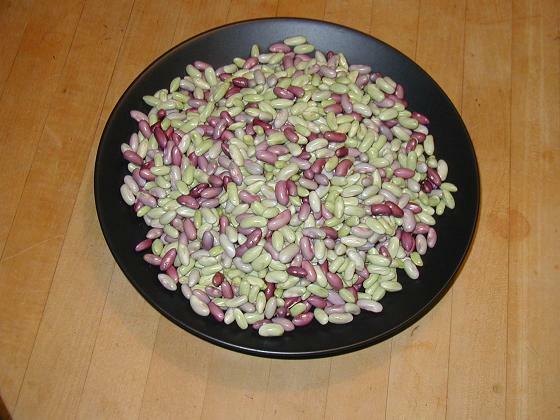 The original 5 cups of shelled beans had increased to 6 cups. I took half the beans and cooking liquid and put them in the refrigerator, to go into the freezer tomorrow. 10) Combine beans, onions, and tomatoes in oven-proof casserole. Return enough been liquid to just cover everything. 11) Top with a half-cup to a cup of coarse bread crumbs and drizzle with olive oil. 12) Bake at 350° Fahrenheit for about 45 minutes, or until the crust is golden and the beans are still intact but very tender. Since the oven was on I roasted a pastured chicken. Shell beans, fragrant with their herbs and additions under a golden, crunchy crust, succulent and tasty chicken, and a green salad made an excellent dinner for the four of us. 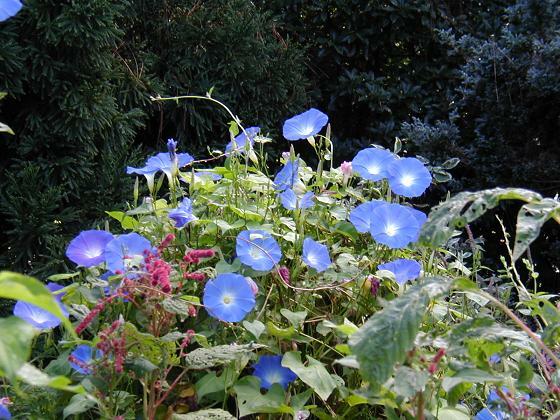 Annuals are often considered useful "fillers" but of less value than more permanent plants. In fact, my son-in-law once asked why anyone would grow annuals, which had to be planted every year, especially when compared to perennials that were expected to return year after year. Some annuals do function in a perennial wise, returning year after year through self-sown seedlings. Green flowered Nicotiana langsdorfii is one such, and certain impatiens - though dying in the winter toss viable seed that survives the cold to grow and flower in the following year. 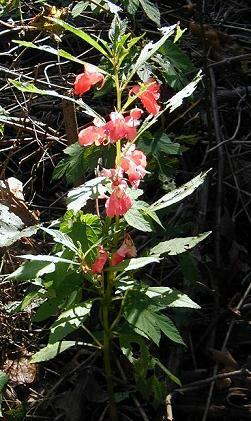 One impatiens that readily does so is white and purple Impatiens balfourii, native to the western Himalayas. And garden balsam also known as rose balsam, Impatiens balsamina, though native to southeast Asia and India, does the same. 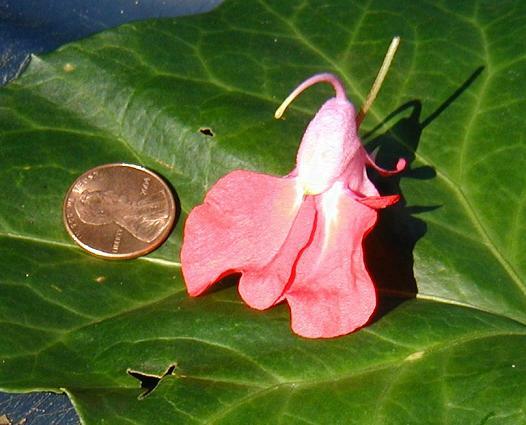 Generally, the form of garden balsam available at nurseries and garden centers each spring is the double-flowered one, with frilly bobbles of flowers scattered up and down the 1- to 2-foot tall stem. In Steve and Melody's garden, the self-sown seedlings have reverted back to the single flowered forms, large and tropical with an elongated spur. Thursday evening was the Enich Garden Party at NewBridge Services. By mid-September the garden is at its most epansive growth. And besides, since Pompton Plains is in a frost pocket, all these magnificent tropicals will be blacked by frost early in October. The garden party is a well-attended event, with NewBridge customers who tend the garden, their families and friends, contributors and volunteers, and people who just like gardens. 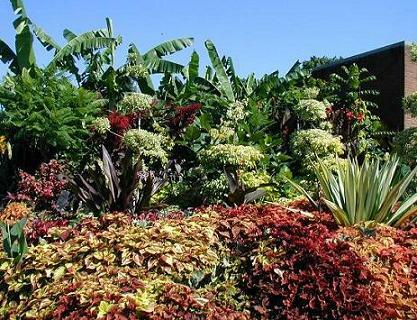 So come one, come all, and enjoy the tropical look of this exhuberant tropical horticultural therapy garden. Ellen and I, accopanied by little Danielle, decided to join in the fun. We went in her convertible, which, after much discussion, had the top up. Just as well, as it absolutely poured on the way there, to the point where some drivers pulled off to the side of the road to wait out the storm. Note: As an aside - that day BelleWood Gardens received .35 inches of rain. Carol, just half a mile from my house, got .2 inches of rain. And in Flemington, New Jersey, Jerry watched as 1.5 inches gushed down in the space of just an hour. It flowed over the lawn and even flooded into the head house for his greenhouse. But it had stopped before we got to Pompton Plains. Just as well, as John had been up and down all day, trying to decide where to have the refreshments if it did / did not rain, and - since the party goes on, rain or shine, what they'd do if it did rain. What's a party without refreshments, andthere were some hot little appetizers, cheese and fruit to enjoy as we wandered outdoors to see the living plants and indoors to admire the photgraphic artwork based on foliage and flower. A laudatory speech with well deserved compliments to John Beirne and the customers who care so well for the beautiful garden. Which, I must add, looked even more vibrant than when I'd seen it last. The crinum had another flower stalk, as did one of the huge bananas. A tall shrub was smothered in yellow flowers. The coleus were flush with new growth, and you'd never know they'd been pruned back just a few weeks ago. The narrow paths behind and through the garden were even more overgrown. The sun was lower (days are appreciably shorter now) and the clouds took on warm tints of rose and gold. Time, we thought, to start homeward. And we did, talking about the garden party and the great time we'd had in a tropical jungle in New Jersey. An overcast day, somewhat warmer and more humid. 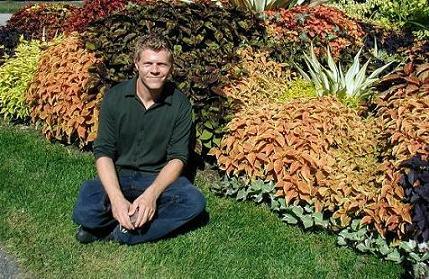 I stepped out the front door and looked at a large copper-leafed coleus spilling out of its pot. 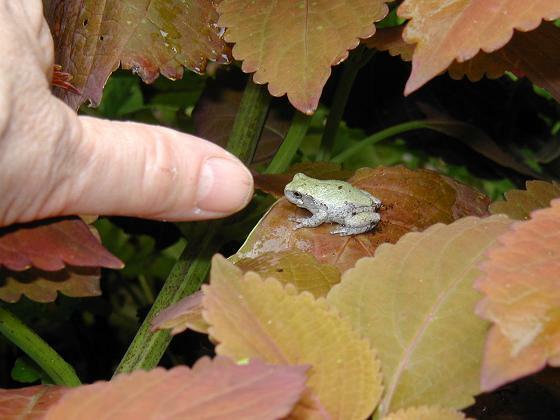 It was decorated with quite the smallest frog I've ever seen. Tiny enough that the leaf didn't even tilt, he was barely the size of my thumbnail. This lengthy string of dry weather must be dreadful for frogs, who breathe, in part, through their moist skin. I flicked a drop of water on the little frog. Earthworms suffer too, as they wriggle out onto the asphalt driveway each night, then die, unable to find their way back before morning. I rescue the ones I find still alive, attempting to find them a place where a modicum of moisture remains under a layer of leaves or mulch. We've had a tiff-tuff of moisture, and there's a 50% chance of rain tonight. I know I'll not be the only one who is grateful when the much-needed rain arrives. I was at the Global Ag store in Clinton last Saturday, looking for a sizeable pot that will hold the big banana plant when it comes indoors for the winter. The weather continues sunny and mild (and dry, desperately dry.) But I was in Clinton for several other stops - the library to pick up an interlibrary loan book, some grocery shopping, etc. And with gasoline at over $3 per gallon I try to group errands even more than I did previously. As I walked around the plant sales area I heard a bumblebee continuously droning. It sounded like it was coming from near a large pot of pink turtlehead, Chelone lyonii, a moisture-loving native plant that flowers at this time. I've seen bumblebees get stuck in the flowers, able to force their way in after nectar and pollen but then have a hard time reversing out again. It was a more dramatic situation though. A praying mantis had captured the bumblebee and was eating it, still alive. A few minutes, then the droning stopped and the mantid continued its meal. 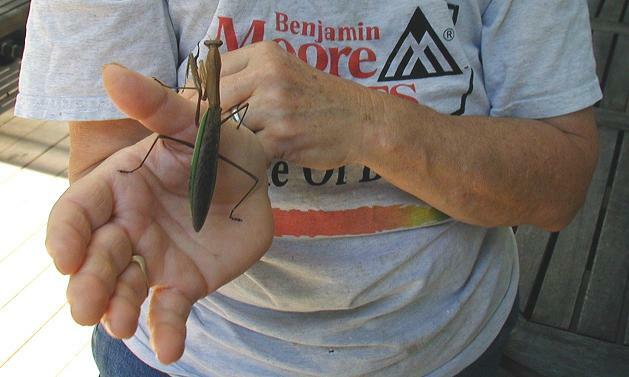 Praying mantids could easily be named preying mantis. Elongated, Modigliani style insects,they eat anything they can capture. Young ones eat aphids. They will also, in cannabalistic manner, eat each other. Adults are also ferociously predacious, eating insects we don't like as well as those we consider beneficial. While I appreciate the praying mantis for its sci-fi, other-worldly appearance and insect-eating prowess, some gardeners dislike its omniverous, non-selective habit of eating any other insect. Not only do adult mantids eat each other, after they mate a female often devours the male. Though large, their green-and-brown coloration and statue-like stillness helps them blend into the shrubbery. Capable of short flights, when on the move these grasshopper relatives leisurely saunter from place to place. Late summer is when I most often find praying mantis at field edges and open meadows. The gravid females will soon be laying their egg masses, which look like a piece of hardened tan foam, attached to flower stems and small branches. Bring one home to the garden if you like, but do not bring it indoors. The eggs will hatch prematurely, and all the numerous little mantids will have nothing to eat but each other. There is a native species, the Carolina mantid, Stagmomantis carolina, which occurs in the southeastern United States westward to Arizona. Both the Chinese mantid, Tenodera aridifolia, and the European mantid, Mantis religiosa were both introduced - at first accidentally and then purposefully in the eastern part of the country. So if, on a golden September afternoon you find one of these aliens stalking their prey in your garden, relax. It is not an escapee from a Hollywood horror flic, merely an example of nature's diversity filling a niche and getting on with its life. Pair "Mexico" and "food," and we think of tortillas and burrito, nachos and salsa. That's Mexican cuisine using their local ingredients. Corn, tomatoes, and chile peppers, chocolate and vanilla. All of September the Morris County Park Commission has a month-long event at the Frelinghuysen Arboretum in Morristown, New Jersey. The focus is on Mexico: primarily the foods but also including traditional herbal remedies of the Mayan and Inca, and ornamental plants so popular in our gardens. Their display gardens are filled with well-labeled plants of Mexican origin, and there are special events on two Sundays, 11 September and 25 September. Letticia and I went to the arboretum on the first Sunday, to enjoy some of the day's numerous activities. There was a salsa tasting, a lecture on vanilla and another on chocolate, the Herb Society of America had a demonstration of Aztec herbs, and the afternoon concluded with a mariachi concert. The Herb Society had an entertaining, attractive, and informative series of displays set up at tables around the room, each with someone there to interpret and explain the plants and what they were used for. 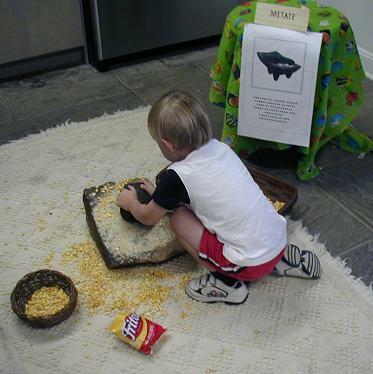 Corn, for example, had two stations. One had corn plants and various familiar products you would find at the grocery store. 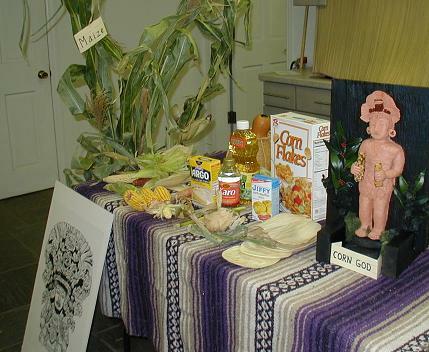 From corn on the cob to breakfast cereal, corn meal, corn starch, corn oil, and corn syrup to Mexican tortillas, there's a lot for the corn god to approve of. There was another table, with three very large balloons shaped like saguaro cactus bobbing about in the background. The woman there was ready to demonstrate de-prickling a cactus pads, nopalito. She had a sturdy glove on one hand but even so I thought just talking about nopalito and the fruit tuna, was good enough. I'd know that both were edible, and I've even made sweet preserves from tuna. What I didn't know was that the "goo" from raw nopalito is useful for treating burns and abrasions. Sort of like aloe vera I guess. Another medicinal display had ashes of hare. The bones were burned, together with the patients hair, and the smoke inhaled to treat headaches. Or perhaps it was pulmonary problems. The man giving the explanation cheerfully voluntered that obtained the bones from a road-killed rabbit. Another very good display and description focused on yarrow, Achillea millefolium. There was a small bouquet of dried yarrow, a soap, a cream, and an egg wash. 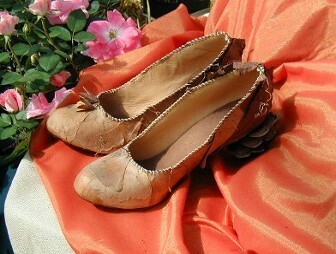 The soap had been made by a friend of the woman's daughter, as a soothing wash for the girl's feet. And, we were told, it works very well to releive the stress and strain of sitting in a wheelchair all day. Chopped leaves are mixed with raw egg yolks and then painted on the skin over broken bones. (For a simple fracture, I would think, rather than a compound fracture where the bone protrudes through the skin.) The yolk tightens up as a mild cast, and supposedly the yarrow speeds healing. 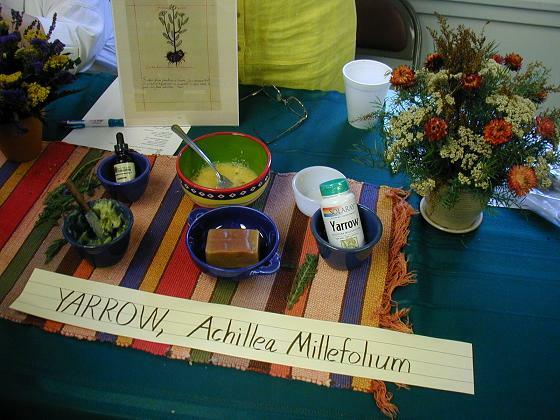 There were commercial yarrow preparations on display as well. The chocolate presentation was excellent. 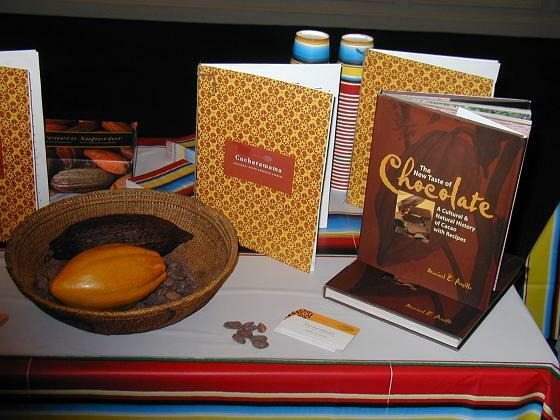 Maricel Presilla has written "The New Taste of Chocolate, a Cultural & Natural History, with Recipes" a new book that focuses on the resurgent interest in artisanal chocolate. The very best cacao, she says, comes from western Venezuela in the area south of Maracaibo lake, and in the foothills of the Andes. This criollo cacao is pale, almost caramel in color even when roasted, with an aromatic and complex flavor. Only 11% of the world's cacao harvels is criollo. Nearly all the rest is forastero, which originally was native to the Amazon River basin. It has a strong, rather bitter taste. The Olmec learned to process chocolate for drinks sometime around 800 B.C. It is not as simple as opening a container of Dutched cocoa powder. First the large pods, growing right from the trunk of the cacao tree must be harvested. Cut open, the 20 to 40 kernels within each pod are removed. Their white color and lack of fragrance offer no hint of what flavorful pleasure lies in store after processing. First the kernels are dried in the sun, during which time they undergo a semi-fermentation process. Then they are roasted before grinding into nibbs, which may then be made into a drink. Enjoyed by Mayan and Aztec who came after the Olmecs, well before the Spanish conquistadores arrived cacao had spread up to Mexico and down to Peru. The Spanish brought chocolate back to Europe. By the mid-seventeenth century, a popular recipe for hot chocolate might include ground hazelnuts and almonds, allspice, anise, rose buds, red pepper, and achiote (annatto) to improve the color. Nutmeg, ginger, and cinnamon were also popular additions. At the conclusion of her talk, everyone attending Maricel's lecture got to taste a sample of fabulous hot chocolate, prepared from the very best regional cacao and flavored with spices. 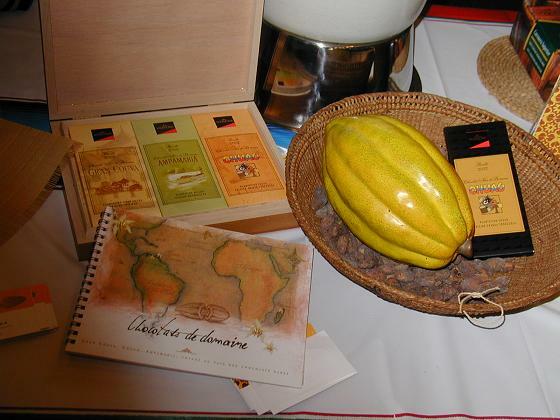 The sleek cacao pod contains 20 to 40 seeds within its yellow husk, very different in appearance from the processed seeds laying in the basket. The lectures on Sunday, 25 September, will be very different: Dr. Mark Olsen of the University of Mexico City will be spreaking on Mexico's Fragile Bio-Diversity, and Dr. Arthur Tucker of Delaware State University will talk about MexicanHherbs on Your Plate. To register, telephone 973 / 326-7603 or go to Frelinghuysen Arboretum Friends. 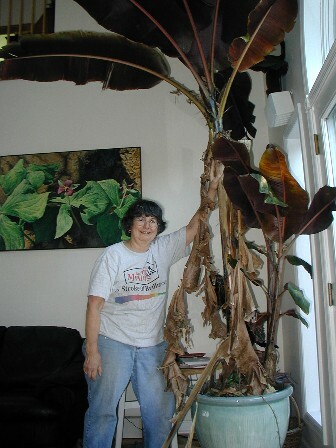 Looking at the extravagant 18- to 20-foot-tall bananas and towering cannas I said "There it is." Jerry, Bea, and I were off on a garden visit to Pompton Plains, New Jersey, to see the Enrich garden that John Beirne cultivates at NewBridge Services. Wrapping around two sides of the low brick building, the lush growth and bright colors are a striking contrast to the typical lawn-and-foundation-shrubs seen elsewhere in the neighborhood. This is an in-you-face garden, right out on the street, impossible to ignore from a passing car, let alone as you walk down the sidewalk. A horticultural therapy program that his clients plant, weed, water, and tend for only a couple of hours each week, John has been cultivating the value of plants and gardening at the mental health facility for five years, as an adjunct to his work as a case manager. When I attended his presentation on tropical plants in containers at Wave Hill (see the Wave Hill Revisited entry in Fourth Week, June Diary entry) John had mentioned the garden and invited me to come and visit it. 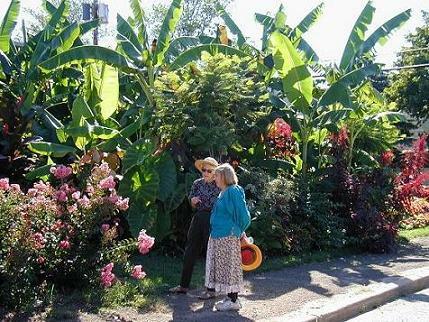 Approximately 20 bananas dominate the garden, their stately height and massive leaves towering over the other plants. "Jungles," John says, "are used to rain. So we don't use drip irrigation to water them. An oscillating sprinkler mimics the rain and helps the plants develop stronger root systems as it patters on their leaves." And also, I figure, washes away some of the exhaust fumes from the passing cars and trucks. The banana leaves are often somewhat tattered by the wind, which can shred them into streamers if it blows really hard. Cannas mimic the bananas on a smaller scale, especially the green or red flushed Indian shot, Canna musifolia, now known as Canna indica. Other cannas with deep red leaves also accent the garden. John's favorite is 'Australia', with shinning deep red foliage. Interestingly, there are seedling cannas volunteering here and there in the garden too, re-seeding from Longwood Gardens water cannas that were planted in a previous year. Derived from Canna flaccida, they can be recognized by their relatively narrow, glaucous foliage and dainty flowers. Not that cannas are hardy here, John hastens to explain. But apparently the seeds can winter over. And the seedling plants flower the same season they begin their growth. Some have delicate, near-to-white flowers of the palest lemon sorbet, while others are cream to orange or speckled with red. Thriving with the care it's been given, each winter new offsets, called pups, form around the parent plant and provide additional plants to enrich the garden the following summer. The purple-leaved mound to the left is a Crinum, a tropical bulb that's had the habit of flowering in its winter quarters under cover. This summer, however, it must have heard John disparaging that behaviour and it moved its blooming time up to September. 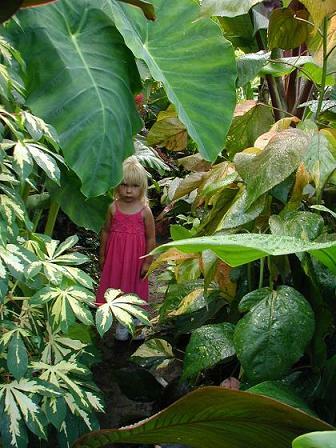 There are various elephant ears, both Alocasia with their downward pointing leaves and Colocasia that aim skyward from each large leaf's attachment to a sturdy petiole. Ornamental sweet potatoes weave through at ground level: the very vigorous 'Tricolor' reaching out over the narrow strip of lawn adjecent to the sidewalk, as if to snag the ankles of a passer-by. 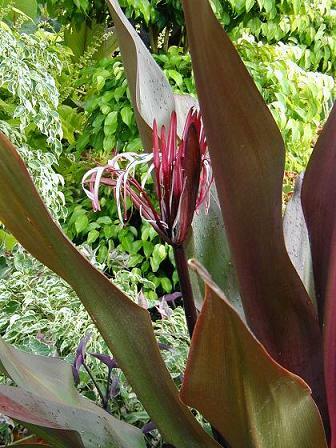 Dark 'Blackie' is even more attractive with its flushes of new growth, the soft brownish bronze-green accenting the various hues of cannas and elephant ears. Spider plant, Chlorophytum comosum serves as an edging on the corner, adaptable to full sun when the plants are first moved outdoors from their winter quarters in an overcrowed 28-foot by 17-foot poly house and equally happy when shaded by their massive neighbors in summer. 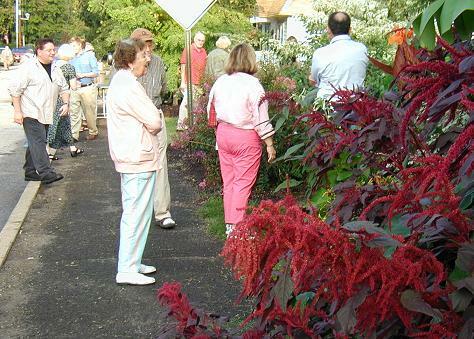 Coleus make rampant billows of color, pruned back several times throughout the growing season to keep them under control. It is difficult to believe this is a summertime-only garden, less than 6 months old. But every year a killing frost comes early in October. Agaves are cut back to tightly furled central core. 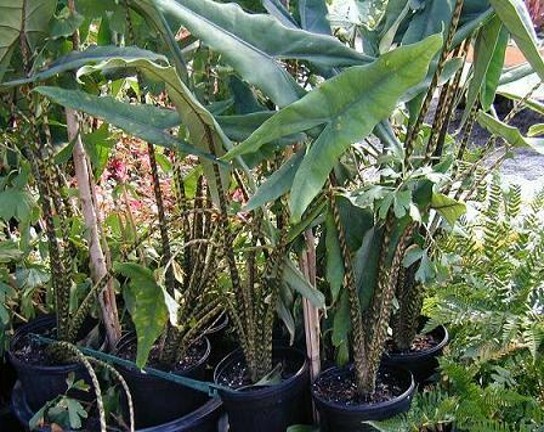 Bananas are de-leafed, chopped back, and crammed into tight pots to keep them from outgrowing the cramped quarters. Coleus cuttings will be rooted, potted, grown on and then in February new cuttings are taken, doubling their numbers, done again, and again. But for now the sun is shining, the garden is growing, and it is a beautiful jungle out there. Barn raising. Quilting bee. Corn husking. Bringing in the sheaves. Whether you're reading Laura Ingalls Wilder's books in the Little House on the Prairie series or scholarly works it becomes apparent that once upon a time there was work which was performed as a community effort. Today that has become more and more absent in our lives. We get together with friends and neighbors on social occasions, but not to work. If the task at hand is more than can be managed individually, labor is hired. There are exceptions. Our neighbors across the road get together with their daughter and son-in-law forthe haying on both properties. And last year we had help with getting in our winter's firewood. That worked so well we're planning to do it again. We've had a wood-burning stove since 1981. Bought when we lived in Connecticut on just over one acre of land, we bought in most of the wood: slabs cut off logs at the local sawmill that Paul then cut to length. 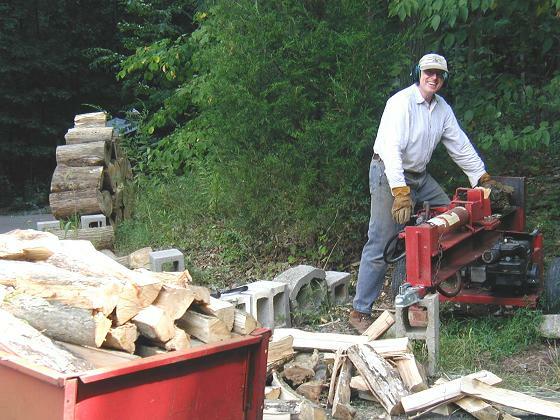 When we moved to New Jersey in 1995, the nearly 9 acres, mostly wooded, offered the option of becoming self-sufficient for firewood. Along with all our other chattel belongings we moved the stove. There was no suitable place to install it, so the first winter it sat in the great room looking decorative but hardly warming. The next year it was installed, with 18 feet of double-wall chimney pipe soaring up to the roof where a triple wall pipe was fitted through. The efficient stove and soaring pipe do an excellent job of heating the mostly open floor plan. You know what they say about wood. It heats you three times: first when you cut it, next when you move it, and finally when you burn it. We use about 2½ to 3 cords of wood. In general we try to cut standing dead trees, although the year I got my tool shed gave us some wonderful red oak for firewood. The trees had to come down before a backhoe could level the site. Another year we had a huge gnarly maple taken down professionally, before large limbs might fall on my head as I gardened. That wood too, warmed us through the winter. Paul has a couple of chain saws and various other bits and bobs. In Connecticut, and our first few years here, he split the wood by hand with wedges and a maul. Then he bought a used hydraulic log splitter. In our early years here a friend from Connecticut would come for a "lumberjack" weekend. A landscape architect and registered forester, he's an expert. He can walk around a tree, look it over, make the felling notch and then cut to drop it just where he wants it. When Hurricane Floyd took down a large black walnut in 1999 it hung up in trees across the drainage creek. Our friend came, looked, cut - and with that single wedge and felling cut dropped it to the ground. Some of the walnut was used for firewood. We did take three "sticks" from the lowest part of the trunk and had someone come with a portable saw mill to turn it into lumber. In 2004 Paul was working in Michigan, only home for alternate weekends. Firewood acquisition quickly became a source of frustration. There simply was not time, as often the weather was inimical: very hot and humid in the summer, heavy rain in other seasons, or strong gusty winds that make dropping large trees even more hazardous. He was becoming more and more upset about the situation. Using the stove really cuts down on our consumption of propane which otherwise is used to heat the house. It was already early November when I was talking about this to our dear friends and neighbors, John and Carol. Carol called up the next day and suggested they come and help us. The men would drop the trees and cut them to size. She and I would run the log splitter. Done! I planned a menu for a hearty lunch and a tasty dinner. John came with his chainsaw, four-wheel, all wheel drive Quad and tow-behind cart. Paul was similarly equipped. The men went off into the woods while Carol and I had a nice chat while waiting for the first load of wood. Soon enough we were working. 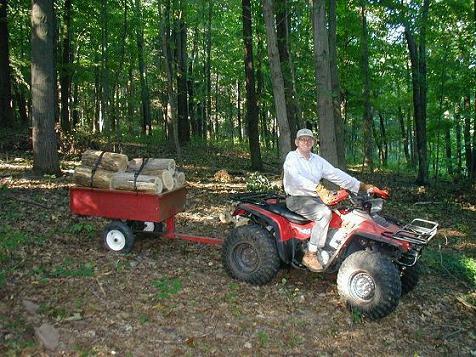 Having two carts worked out well - one was parked near the log splitter to be filled with split firewood while the other was in the woods being filled with logs. Since the men were cutting standing dead trees the wood was ready to use right away. With four people working we got a tremendous amount of work accomplished. In 6 hours we made huge strides in cutting, splitting, and stacking wood. But we were still not all the way there. However our son and daughter and their families were coming down for Thanksgiving. Our daughter and son-in-law also have a wood-burning stove, so Steve is skilled in tree cutting. And our son has also cut down trees, though smaller ones. With the three men cutting, bucking, hauling, splitting and stacking the wood supply seemed to just magically increase, while we three women prepared a Thanksgiving feast. 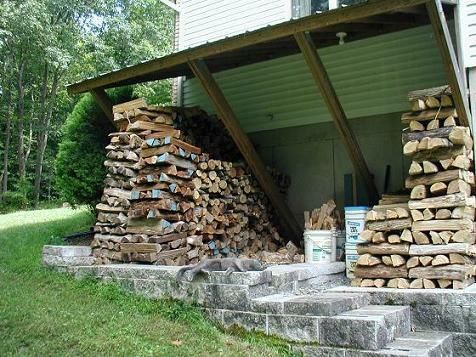 And by the weekend's end we had our winter's supply of firewood. Thanks to family, friends and neighbors we were warmed in many ways that winter, not only the wood we burned but also the warming memories. This fall we're planning on swapping work days with John and Carol: a day cutting and splitting firewood at their place and another day here at Bellewood Gardens, getting together and getting winter's firewood laid by, friends helping friends by working together. There are gardeners in heaven. If you want to ask for help, the patron saint of gardeners is St. Fiacre (pronounced fair-cra). An Irish prince from Kilfiachra, he chose the religious life and was ordained as a priest. Choosing the contemplative life, he became a hermit and lived on the banks of the River Nore where he enjoyed the planting and harvesting of crops, and studied the healing properties of herbs. Disciples flocked to him, disturbing the solitude he so greatly desired. Leaving Ireland for France in 628 A.D., Fiacre arrived at Meaux where Faro was then bishop. Having been granted a woodland site at Breuil, Fiacre built a cell, and prepared to live a life of prayer and contemplation, making a beautiful garden of herbs and flowers around his cell. Just as in Ireland, people flocked to him, and he asked Faro for more land. Offered as much land as he could dig in one day using only his staff, the next morning Fiacre walked around the perimeter of the land he wanted dragging his spade behind him. Miraculously, wherever the spade touched the land trees were toppled, bushes and briars were uprooted, and rocks were cleared away. Further, the soil was left in well-tilled furrows. As well as his cell, Fiacre built an oratory, a small chapel or room as a place of prayer and private devotions in honor of the Blessed Virgin Mary. He lived a life of great mortification: praying, fasting, and keeping vigil - and the manual labor of the garden. Some sites pertaining to Catholic saints list his feast day as September 1st, while others mention August 30th. St. Fiacre can be recognized by the traditional spade with a triangular blade. Often he is holding a bouquet of sunflowers. Most often he is represented as an elderly man. 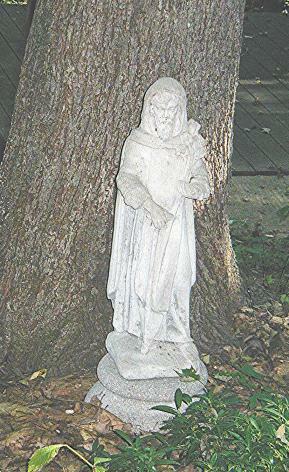 Many miracles were claimed through St. Fiacre's working the land and interceding for others. As well as patron saint of gardeners, he is also the patron saint of Parisian cab drivers, where the horse-drawn hackney coaches were called "fiacres", after the Hotel de St. Fiacre where such carriages were first for hire.